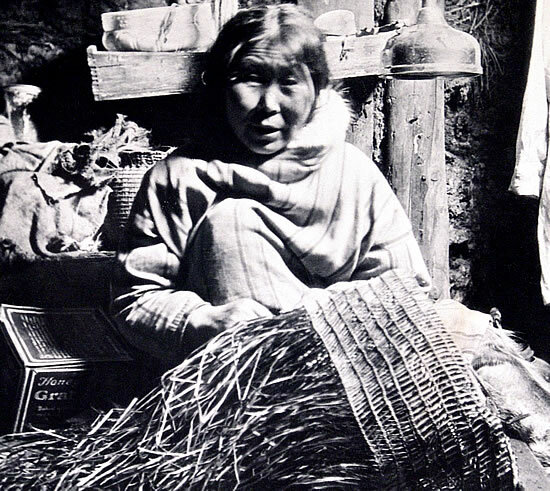 Woman twining an issran, grass pack basket, Kwigillingok, 1931. Theresa Moses said: "I love grass and use it for everything. I always have some around. The grass lets me survive, and they are precious things." Grass boot liners which both insulated feet and wicked away moisture to keep them dry and warm, made by Lucy Jacobs of Bethel before 1970. 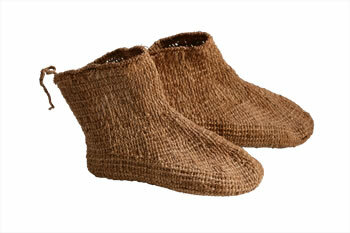 Theresa Moses recalled: "I used grass in my boots all the time and I never saw store bought socks. We wore only twined grass socks." 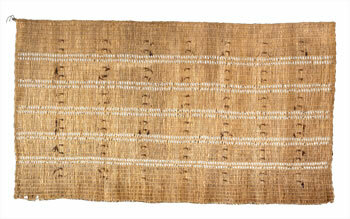 Martina John recalled: "Grass mats had their own designs, and the wall mats had different designs. They made small x's on the edges, but the designs got lost before I learned how to twine." 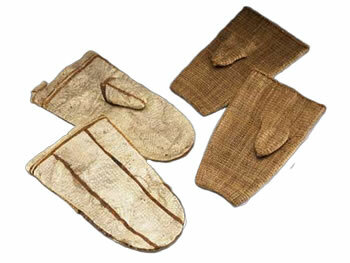 Fish skin mittens with grass liners used for kayak travel during spring in bad weather. Grass shirt used to keep a person warm and dry. 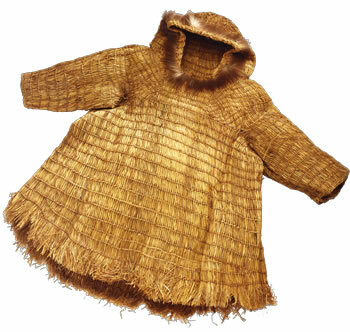 Elena Charles remarked: "This is a grass qaspeq [hooded garment]. The neck opening has a thin strip of wolverine. A woman who was an expert twiner made it just like a parka." All plant leaves have a waxy covering on their surface known as cuticle, which slows the loss of moisture from the leaf to the atmosphere. Though this covering serves primarily to keep moisture in, it also prevents excess water (such as dewdrops) from entering the leaf. The cuticle's properties and the tight Yup'ik twining techniques account for the water repellent nature of grass mats and clothing. 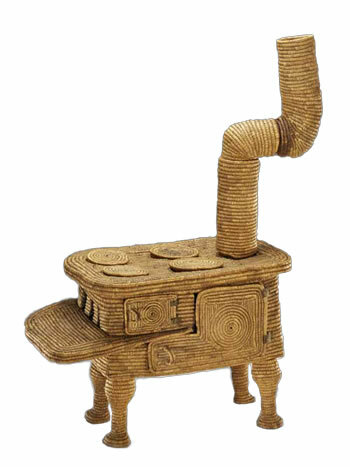 Model stove made of grass in 1908 as a trade item. Snow goggles Henry Alikayak said: "Someone made these with coarse seashore grass. 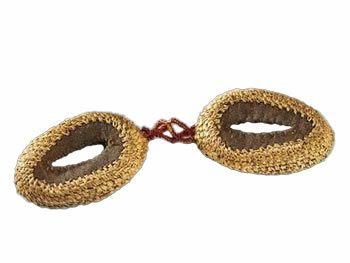 When I tried them on, they were comfortable and useable."